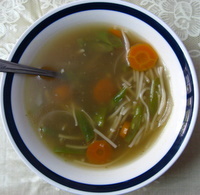 Talumein soup is always on the menu of any Chinese restaurant in India. I always thought that it was an authentic Chinese recipe. I did some research to find out what does 'talumein' mean, but in vain. There is no clear answer even on the internet. Now I am beginning to think that even this soup is like many other 'Indo-Chinese' recipes, we have in India. This is a very popular soup and if made at home, undoubtedly very healthy as well. I might be wrong, but I think that 'talumein' is a fancy name for a noodle soup. The two most common forms are 'chicken talumein soup' and 'vegetable talumein soup'. Both are very tasty. Anyway, I don't bother much about the name, coz a rose is still a rose by any other name. Although I am still curious to know where it originated from. So if you have any information regarding the same, please enlighten me as well. If you are a chicken lover then you can add 1 cup of shredded chicken in the following recipe and use chicken stock instead of vegetable stock. You can use water instead of stock but the taste won't be the same. If you don't have the time to make a vegetable stock by simmering for 2 hours and if you cannot get hold of any ready made stock from the supermarket, then you might want to try out my quick pressure cooker stock. Quick Vegetable stock made in a pressure cooker. Pressure cook till the 1st whistle and strain it. Use this as a stock. Won't take more than 20 minutes. Heat oil in a wok and add the ginger-garlic, followed by the onions, carrots and beans. Stir fry for a few minutes and the chili and stock. Bring to a boil and add the capsicum, soy sauce and salt. After 5 minutes stir in the boiled noodles. Cook for 2-3 minutes If seeming too thin then add a little cornflour mixed with cold water to thicken it just a bit. That is it, dig in and enjoy. By the way, some other vegetables that can be used in this soup are cabbage, baby corn, mushrooms or any other of your choice. Go ahead spoil yourself.